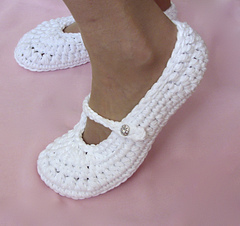 A lovely pattern to make bridal or wedding slippers. Make a pair for the bride and her bridal party. 3.5 - 4.5 ounces of yarn - depending on size made. 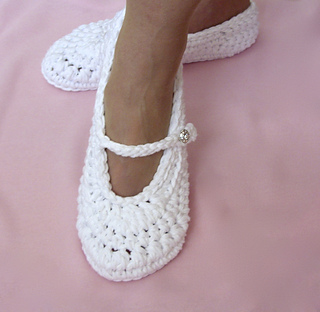 This lovely crochet pattern to make Mary Jane style wedding slippers uses 2 strands of worsted weight #4 yarn of cotton and acrylic blend giving the shoes nice body, cushioning and comfort. Stitch count is given in each row so you can check your work after each row for a successful outcome. Each Mary Jane wedding slipper has an adjustable eyelet strap and one button for closure.